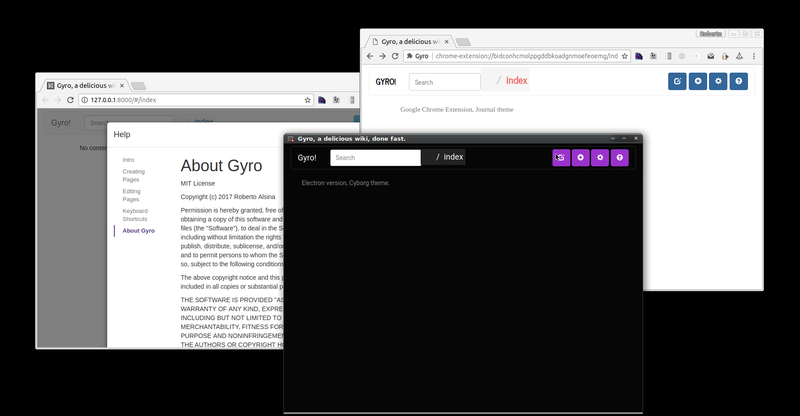 It was just a few days ago that I started an experimental wiki project called Gyro ... it's always fun when a project just grows features organically. It does this, so it makes sense to make it do that, and then this other thing is easy, and so on. The behavior is identical in both cases, it's just a matter of where things are saved, and how they are retrieved. The goal is that you should not be able to tell apart one implementation from the other, but of course YMMV. And since I was already doing a chrome extension ... how hard would it be to run it as an electron "desktop" app? Well, not very. In fact, there are no code changes at all. It's just a matter of packaging. But in any case, it's nice to see an app take shape this fast and this painlessly.